The Protocol on protection and welfare of animals annexed to the Treaty requires that in formulating and implementing agriculture and transport policies, the Community and the Member States are to pay full regard to the welfare requirements of animals. Under Council Directive 91/628/EEC of 19 November 1991 on the protection of animals during transport (3), the Council has adopted rules in the field of the transport of animals in order to eliminate technical barriers to trade in live animals and to allow market organisations to operate smoothly, while ensuring a satisfactory level of protection for the animals concerned. The Report from the Commission to the European Parliament and the Council on the experience acquired by Member States since the implementation of Council Directive 95/29/EC of 29 June 1995 amending Directive 91/628/EEC concerning the protection of animals during transport (4), as required under Directive 91/628/EEC, recommended amending current Community legislation in this field. Most Member States have ratified the European Convention for the protection of animals during international transport and the Council has given a mandate to the Commission to negotiate on behalf of the Community the revised European Convention for the protection of animals during international transport. For reasons of animal welfare the transport of animals over long journeys, including animals for slaughter, should be limited as far as possible. The Council invited the Commission on 19 June 2001 (5) to submit proposals for ensuring effective implementation and strict enforcement of existing Community legislation, improving the protection and welfare of animals as well as preventing the occurrence and spread of infectious animal diseases, and putting in place more stringent requirements so as to prevent pain and suffering in order to safeguard the welfare and health of animals during and after transport. ensuring that veterinary checks at Community border inspection posts include comprehensive inspection of the welfare conditions in which animals are transported. The Scientific Committee on Animal Health and Animal Welfare adopted an opinion on the welfare of animals during transport on 11 March 2002. Community legislation should therefore be amended to take into account new scientific evidence while giving priority to the need for its enforceability to be properly ensured in the immediate future. Specific provisions for poultry, cats and dogs will be set out in appropriate proposals when the relevant opinions of the European Food Safety Authority (EFSA) are available. In the light of experience gained under Directive 91/628/EEC in harmonising Community legislation on the transport of animals, and the difficulties encountered due to the differences in transposition of that Directive at national level, it is more appropriate to set out Community rules in this field in a regulation. Pending the adoption of detailed provisions for certain species having particular needs and representing a very limited part of the Community livestock, it is appropriate to allow Member States to establish or maintain additional national rules applying to transport of animals of such species. In order to ensure a consistent and effective application of this Regulation across the Community in the light of its basic principle according to which animals must not be transported in a way likely to cause injury or undue suffering to them, it is appropriate to set out detailed provisions addressing the specific needs arising in relation to the various types of transport. Such detailed provisions should be interpreted and applied in accordance with the aforesaid principle and should be timely updated whenever, in particular in the light of new scientific advice, they appear no longer to ensure compliance with the above principle for particular species or types of transport. Transport for commercial purposes is not limited to transport where an immediate exchange of money, goods or services takes place. Transport for commercial purposes includes, in particular, transport which directly or indirectly involves or aims at a financial gain. The unloading and subsequent reloading of animals could also be a source of stress for them and contact at control posts, formerly referred to as staging points, could in certain conditions lead to the spread of infectious diseases. It is therefore appropriate to provide for specific measures safeguarding the health and welfare of animals when resting at control posts. 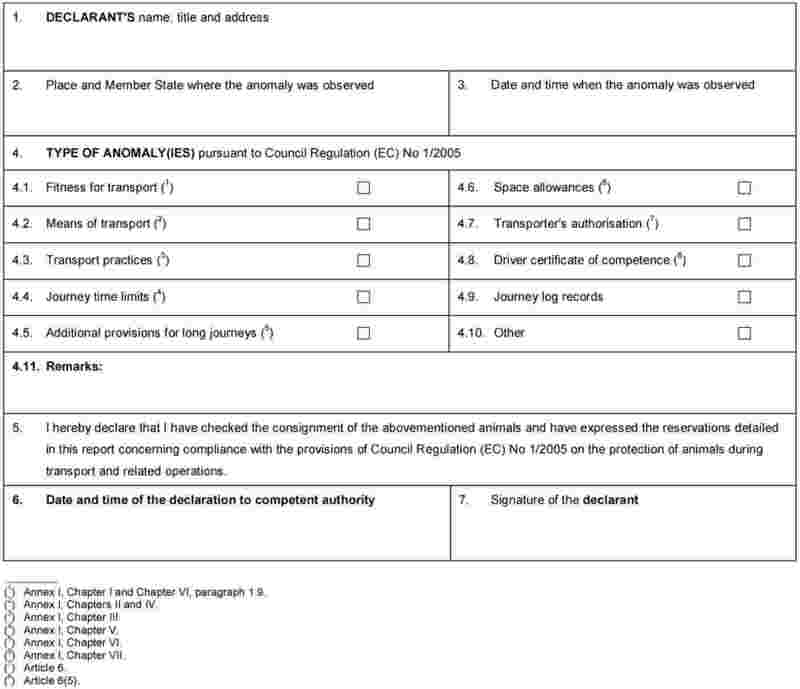 As a result, it is necessary to amend the provisions of Council Regulation (EC) No 1255/97 of 25 June 1997 concerning Community criteria for staging points and amending the route plan referred to in the Annex to Directive 91/628/EEC (6). Poor welfare is often due to lack of education. Therefore, training should be a prerequisite for any person handing animals during transport and training should be provided only by organisations approved by the competent authorities. Welfare conditions of animals during transport result mainly from the day-to-day conduct of the transporters. Checks by competent authorities may be hindered as transporters can freely operate in different Member States. Therefore, transporters should be more accountable and transparent concerning their status and operations. In particular they should provide proof of their authorisation, systematically report any difficulty and keep precise records of their actions and the results. Animal transport involves not only transporters but also other categories of operators such as farmers, traders, assembly centres and slaughterhouses. As a consequence, some obligations regarding the welfare of animals should be extended to any operator involved in the transport of animals. Assembly centres play a critical role in the transport of some livestock species. Therefore, assembly centres should ensure that Community legislation on the protection of animals during transport is known and respected by their employees and visitors. Long journeys are likely to have more detrimental effects on the welfare of animals than short ones. Hence specific procedures should be designed to ensure better enforcement of the standards, in particular by increasing the traceability of such transport operations. Council Regulation (EEC) No 3820/85 of 20 December 1985 on the harmonisation of certain social legislation relating to road transport (7) provides for maximum driving periods and minimum rest periods for road drivers. It is appropriate that journeys for animals are similarly regulated. Council Regulation (EEC) No 3821/85 of 20 December 1985 on recording equipment in road transport (8) provides for recording equipment to be installed and used to ensure effective checking on compliance with social legislation concerning road transport. It is necessary that such record data be made available and checked so as to enforce travelling time limits under animal welfare legislation. Insufficient exchange of information between competent authorities leads to inadequate enforcement of Community legislation for the protection of animals during transport. Accordingly, it is necessary to set up flexible procedures to improve the level of collaboration between the competent authorities in the different Member States. Registered Equidae, as defined in Article 2(c) of Directive 90/426/EEC (9), are frequently transported for non-commercial purposes and such transports must be carried out in line with the overall objectives of this Regulation. Having regard to the nature of such movements, it appears appropriate to derogate from certain provisions where registered Equidae are transported for competition, races, cultural events or breeding. However, it is not appropriate to apply such derogation to Equidae transported, directly or after transit through a market or marshalling centre, to a slaughterhouse for slaughter, which in accordance with Article 2(d) and 8(1), second indent of Directive 90/426/EEC, are to be considered as ‘Equidae for slaughter’. Inadequate follow-up of infringements of legislation on animal welfare encourages non-compliance with such legislation and leads to distortion of competition. Therefore, uniform procedures should be established throughout the Community to increase checks and the imposition of penalties for infringements of animal welfare legislation. The Member States should lay down rules on penalties applicable to infringements of the provisions of this Regulation and ensure that they are implemented. Those penalties must be effective, proportionate and dissuasive. A significant number of animals are transported by livestock vessels over very long journeys from and within the Community and transport by sea can be checked at the place of departure. Therefore, it is essential to set up specific measures and standards for this mode of transport. In the interests of consistency of Community legislation, Council Directive 64/432/EEC of 26 June 1964 on animal health problems affecting intra-Community trade in bovine animals and swine (10) should be amended so as to adapt it to this Regulation as regards the approval of assembly centres and the requirements for transporters. Council Directive 93/119/EC of 22 December 1993 on the protection of animals at the time of slaughter and killing (11) should also be amended so as to adapt it to this Regulation as regards the use of electric prods. Rules and information procedures laid down by Council Directive 89/608/EEC of 21 November 1989 on mutual assistance between the administrative authorities of the Member States and cooperation between the latter and the Commission to ensure the correct application of legislation on veterinary and zootechnical matters (12) should be applied to animal welfare during transport in order to ensure compliance with this Regulation. Commission Decision 98/139/EC (13) lays down certain detailed rules concerning on-the-spot checks carried out in the veterinary field by Commission experts in the Member States which should help to ensure that this Regulation is complied with in a uniform manner. This Regulation sets out provisions concerning ventilation in road vehicles transporting livestock on long journeys. Accordingly, Council Regulation (EC) No 411/98 of 16 February 1998 on additional animal protection standards applicable to road vehicles used for the carriage of livestock on journeys exceeding eight hours (14) should be repealed. It is appropriate to provide for a simple procedure for the Council to update certain important technical elements of this Regulation in particular in the light of an assessment of its impact on transport of live animals within an enlarged Community and establish the specifications of the Navigation System to be used for all means of transport by road in the light of the future technological developments in the area such as the coming into fruition of the Galileo system. It is appropriate to provide for a possibility to establish derogations to take account of the remoteness of certain regions from the mainland of the Community, in particular for outermost regions referred to in Article 299 of the Treaty. 1. This Regulation shall apply to the transport of live vertebrate animals carried out within the Community, including the specific checks to be carried out by officials on consignments entering or leaving the customs territory of the Community. transport carried out by farmers, of their own animals, in their own means of transport for a distance of less than 50 km from their holding. 3. This Regulation shall not be an obstacle to any stricter national measures aimed at improving the welfare of animals during transport taking place entirely within the territory of a Member State or during sea transport departing from the territory of a Member State. 4. This Regulation shall apply without prejudice to Community veterinary legislation. 5. This Regulation shall not apply to the transport of animals which does not take place in connection with an economic activity and to the transport of animals directly to or from veterinary practices or clinics, under the advice of a veterinarian. ‘place of departure’ means the place at which the animal is first loaded on to a means of transport provided that it had been accommodated there for at least 48 hours prior to the time of departure. ‘vehicle’ means a means of transport fitted with wheels which is propelled or towed. No person shall transport animals or cause animals to be transported in a way likely to cause injury or undue suffering to them. water, feed and rest are offered to the animals at suitable intervals and are appropriate in quality and quantity to their species and size. the expected duration of the intended journey. 2. The transporter shall make the documentation provided for in paragraph 1 available to the competent authority upon request. 1. No person shall contract or subcontract the transport of animals except to transporters authorised in accordance with Article 10(1) or Article 11(1). 2. Transporters shall identify a natural person responsible for the transport and ensure that information on the planning, execution and completion of the part of the journey under their control can be obtained at any time. a natural person is responsible for providing information on the planning, execution and completion of the journey to the competent authority at any time. 4. For long journeys between Member States and with third countries for domestic Equidae other than registered Equidae, and domestic animals of bovine, ovine, caprine and porcine species, transporters and organisers shall comply with the provisions on the journey log set out in Annex II. 1. No person shall act as a transporter unless he holds an authorisation issued by a competent authority pursuant to Article 10(1) or, for long journeys, Article 11(1). A copy of the authorisation shall be made available to the competent authority when the animals are transported. 2. Transporters shall notify to the competent authority any changes in relation to the information and documents referred to in Article 10(1) or, for long journeys, Article 11(1), no more than 15 working days from the date the changes took place. 3. Transporters shall transport animals in accordance with the technical rules set out in Annex I. 4. Transporters shall entrust the handling of the animals to personnel who have received training on the relevant provisions of Annexes I and II. 5. No person shall drive, or act as an attendant on a road vehicle transporting domestic Equidae or domestic animals of bovine, ovine, caprine or porcine species or poultry unless he holds a certificate of competence pursuant to Article 17(2). The certificate of competence shall be made available to the competent authority when the animals are transported. where the driver performs the functions of attendant. 7. Paragraphs 1, 2, 4 and 5 shall not apply to persons transporting animals up to a maximum distance of 65 km counted from the place of departure to the place of destination. 8. Transporters shall make available the certificate of approval as provided for in Article 18(2) or Article 19(2) to the competent authority of the country to which animals are transported. 9. Transporters of domestic Equidae, except registered Equidae, and domestic animals of the bovine, ovine, caprine and porcine species over long road journeys shall use a navigation system as referred to in Annex I, Chapter VI, paragraph 4.2, as from 1 January 2007 for means of transport by road for the first time in service and as from 1 January 2009 for all means of transport by road. They shall keep the records obtained by such navigation system for at least three years and shall make them available to the competent authority upon request, in particular when the checks referred to in Article 15(4) are carried out. Implementing measures concerning this paragraph may be adopted in accordance with the procedure referred to in Article 31(2). 1. No person shall transport animals by road for a long journey unless the means of transport has been inspected and approved under Article 18(1). 2. No person shall transport by sea, for more than 10 nautical miles, domestic Equidae and domestic animals of bovine, ovine, caprine or porcine species from a Community port unless the livestock vessel has been inspected and approved under Article 19(1). 3. The provisions of paragraph 1 and paragraph 2 apply to containers used for the transport of domestic Equidae or domestic animals of bovine, ovine, caprine or porcine species by road and/or by water, for long journeys. 1. Keepers of animals at the place of departure, transfer or destination shall ensure that the technical rules set out in Chapters I and III, section 1, of Annex I in respect of the animals being transported are met. 2. Keepers shall check all animals arriving at a place of transit or a place of destination and determine if the animals are or have been subject to a long journey between Member States and with third countries. In the case of long journeys for domestic Equidae, other than registered Equidae, and domestic animals of bovine, ovine, caprine and porcine species, keepers shall comply with the provisions on the journey log set out in Annex II. 1. Operators of assembly centres shall ensure that animals are treated in accordance with the technical rules set out in Chapters I and III, section 1, of Annex I.
adopt, monitor and enforce the necessary internal rules in order to ensure compliance with points (a) to (d). the applicants or their representatives have no record of serious infringements of Community legislation and/or national legislation on the protection of animals in the three years preceding the date of the application. This provision shall not apply where the applicant demonstrates to the satisfaction of the Competent Authority that it has taken all necessary measures to avoid further infringements. 2. The competent authority shall issue authorisations as provided for in paragraph 1 in accordance with the specimen set out in Chapter I of Annex III. Such authorisations shall be valid for not more than five years from the date of issue and shall not be valid for long journeys. contingency plans in the event of emergencies. for all means of transport by road, as from 1 January 2009. 3. The competent authority shall issue such authorisations in accordance with the specimen set out in Chapter II of Annex III. Such authorisations shall be valid for not more than five years from the date of issue and shall be valid for all journeys, including long journeys. Transporters shall apply for an authorisation pursuant to Article 10 or to Article 11 to no more than one competent authority, in no more than one Member State. 1. The competent authority may limit the scope of an authorisation provided for in Article 10(1) or for long journeys, in Article 11(1) according to criteria that may be verified during transport. 2. The competent authority shall issue each authorisation provided for in Article 10(1) or for long journeys, in Article 11(1) with a number unique in the Member State. The authorisation shall be drawn up in the official language(s) of the Member State of issue and in English when the transporter is likely to operate in another Member State. 3. The competent authority shall record authorisations provided for in Article 10(1) or Article 11(1) in a manner enabling the competent authority to identify transporters rapidly, in particular in the event of failure to comply with the requirements of this Regulation. 4. The competent authority shall record authorisations issued pursuant to Article 11(1) in an electronic database. The transporter's name and authorisation number shall be made publicly available during the period of validity of the authorisation. Subject to Community and/or national rules regarding privacy protection, public access to other data in relation to transporters' authorisations shall be granted by Member States. The database shall also include decisions notified under Article 26(4)(c) and (6). send details as soon as possible of the intended long journeys set out in the journey log to the competent authority of the place of destination, of the exit point or of the control post via the information exchange system referred to in Article 20 of Directive 90/425/EEC. 2. By way of derogation to paragraph 1(c), the stamping of the journey log shall not be required for transports using the system referred to in Article 6(9). 1. 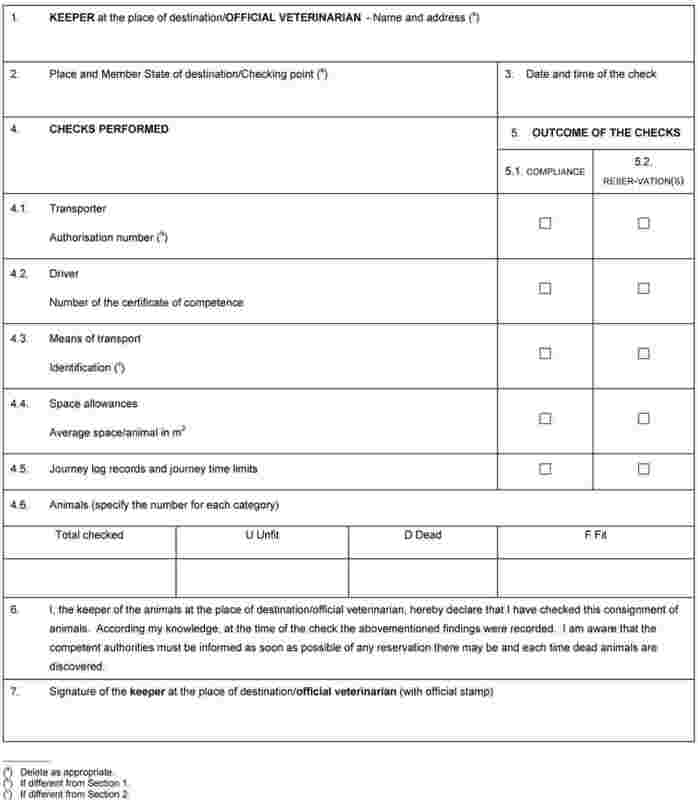 The competent authority shall carry out at any stage of the long journey appropriate checks on a random or targeted basis to verify that declared journey times are realistic and that the journey complies with this Regulation and in particular that travel times and rest periods have complied with the limits set out in Chapter V of Annex I. 2. 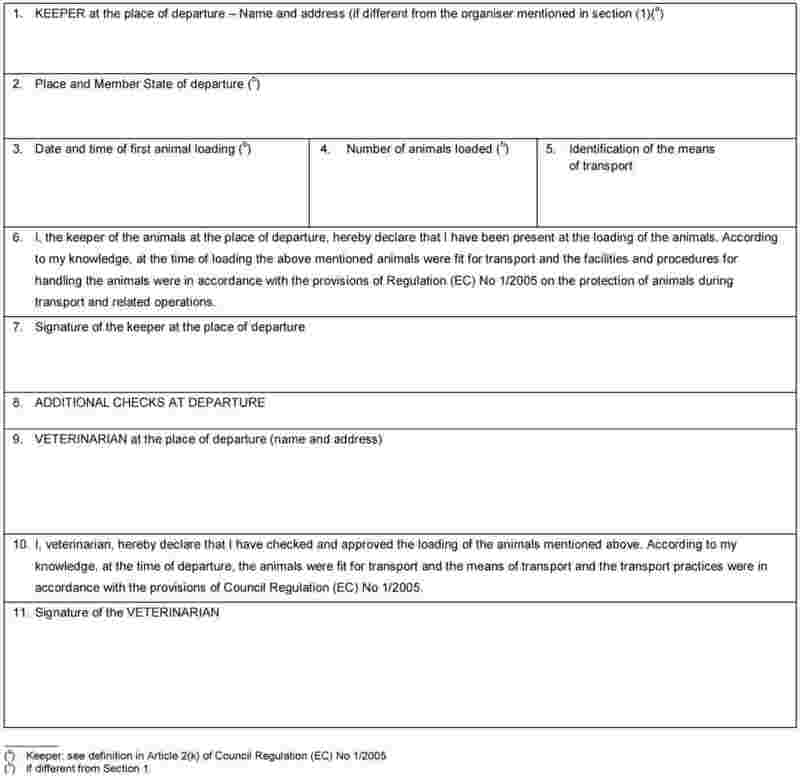 In the case of long journeys between Member States and with third countries, the checks at the place of departure for fitness for transport, as referred to in Chapter I of Annex I, shall be performed before the loading as part of the animal health checks as set out in the corresponding veterinary Community legislation, within the time limits provided by such legislation. 3. When the place of destination is a slaughterhouse, the checks provided for in paragraph 1 may be performed as part of the animal welfare inspection as set out in Regulation (EC) No 854/2004 of the European Parliament and of the Council of 29 April 2004 laying down specific rules for the organisation of official controls on products of animal origin intended for human consumption (19). 4. The records of the movements of the means of transport by road obtained from navigation system may be used for carrying out these checks where appropriate. 1. Training courses shall be available for personnel of transporters and assembly centres for the purposes of Article 6(4) and Article 9(2)(a). 2. The certificate of competence for drivers and attendants of road vehicles transporting domestic Equidae or domestic animals of bovine, ovine, caprine or porcine species or poultry as referred to in Article 6(5) shall be granted in accordance with Annex IV. The certificate of competence shall be drawn up in the official language(s) of the Member State of issue and in English when the driver or attendant is likely to operate in another Member State. The certificate of competence shall be issued by the competent authority or body designated for this purpose by the Member States and in accordance with the specimen set out in Chapter III of Annex III. The scope of the said certificate of competence may be limited to a specific species or group of species. have been inspected by the competent authority or body designated by a Member State and found to comply with the requirements of Chapters II and VI of Annex I applicable to the design, the construction and the maintenance of means of transport by road used for long journeys. 2. 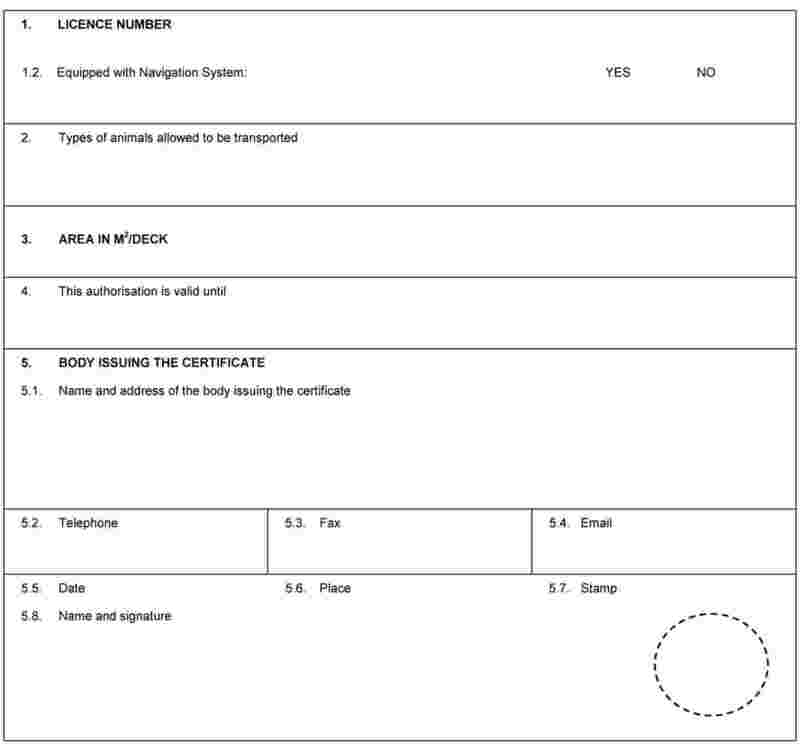 The competent authority or body designated by a Member State shall issue each certificate with a number unique in the Member State and in accordance with the specimen set out in Chapter IV of Annex III. The certificate shall be drawn up in the official language(s) of the Member State of issue and in English. Certificates shall be valid for a period of not more than five years from the date of issue and shall become invalid as soon as the means of transport are modified or refitted in a way that affects the welfare of the animals. 3. The competent authority shall record the certifications of the approval of the means of transport by road for long journeys in an electronic database in a manner enabling them to be rapidly identified by the competent authorities in all Member States, in particular in the event of failure to comply with the requirements of this Regulation. 4. Member States may grant derogations to the provisions of this Article and to the provisions of Chapter V, paragraph 1.4, point (b) and Chapter VI of Annex I for means of transport by road in respect of journeys not exceeding 12 hours in order to reach the final place of destination. has been inspected by the competent authority or body designated by a Member State and found to comply with the requirements of Section 1 of Chapter IV of Annex I regarding the construction and equipment for livestock vessels. 2. The competent authority or body designated by a Member State shall issue each certificate with a number unique in the Member State. The certificate shall be drawn up in at least one of the official language(s) of the Member State of issue and in English. Certificates shall be valid for a period of not more than five years from the date of issue and shall become invalid as soon as the means of transport are modified or refitted in a way that affects the welfare of the animals. 3. The competent authority shall record approved livestock vessels in a manner enabling them to be rapidly identified, in particular in the event of failure to comply with this Regulation. 4. The competent authority shall record the certifications of the approval of livestock vessels in an electronic database, in a manner enabling them to be rapidly identified, in particular in the event of failure to comply with the requirements of this Regulation. the equipment referred to in Chapter IV of Annex I remains in good working order. feed and water arrangements are in accordance with Section 2 of Chapter IV of Annex I.
whether domestic Equidae and domestic animals of bovine, ovine, caprine and porcine species have been or are to be transported over long journeys. 2. 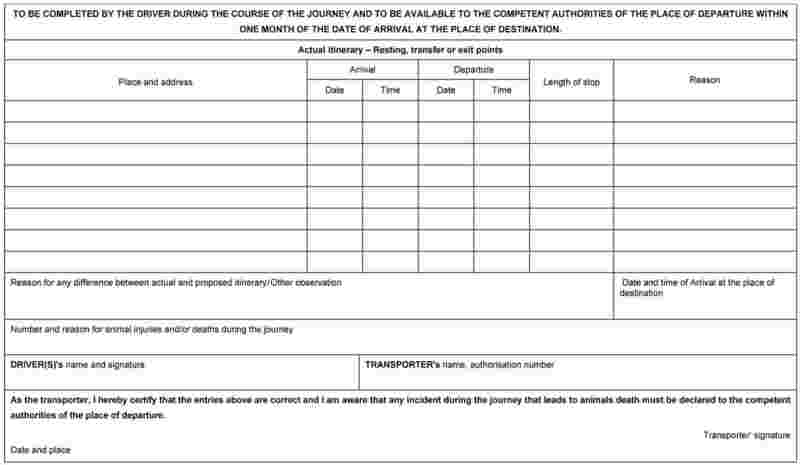 In the case of long journeys for domestic Equidae and domestic animals of bovine, ovine, caprine and porcine species, official veterinarians of exit points and border inspection posts shall perform and record the checks listed in Section 3 ‘Place of destination’ of the journey log in Annex II. Records of those checks and the check provided for in paragraph 1 shall be kept by the competent authority for a period of at least three years from the date of the checks, including a copy of the corresponding record sheet or print-out as referred to in Annex I or Annex IB to Regulation (EEC) No 3821/85 if the vehicle is covered by that Regulation. 3. Where the competent authority considers that animals are not fit to complete their journey, they shall be unloaded, watered, fed and rested. 1. The competent authority shall take the necessary measures to prevent or reduce to a minimum any delay during transport or suffering by animals when unforeseeable circumstances impede the application of this Regulation. The competent authority shall ensure that special arrangements are made at the place of transfers, exit points and border inspection posts to give priority to the transport of animals. 2. No consignment of animals shall be detained during transport unless it is strictly necessary for the welfare of the animals or reasons of public safety. No undue delay shall occur between the completion of the loading and departure. If any consignment of animals has to be detained during transport for more than two hours, the competent authority shall ensure that appropriate arrangements are made for the care of the animals and, where necessary, their feeding, watering, unloading and accommodation. 1. Where a competent authority finds that any provision of this Regulation is not being complied with, or has not been complied with, it shall take, or require the person responsible for the animals to take, any necessary action required to safeguard the welfare of the animals. Such action shall not be likely to cause unnecessary or additional suffering to the animals and shall be proportionate to the seriousness of the risks involved. The Competent authority shall recover the costs of such action in the appropriate manner. unloading the animals and holding them in suitable accommodation with appropriate care until the problem is resolved. Where there is no other means of safeguarding the welfare of the animals, they shall be humanely killed or euthanised. 3. Where action is to be taken due to non-compliance with this Regulation as referred to in paragraph 1, and it is necessary to transport the animals in breach of some of the provisions of this Regulation, the competent authority shall issue an authorisation for the transport of the animals. The authorisation shall identify the animals concerned and define the conditions under which they may be transported until this Regulation is fully complied with. Such authorisation shall accompany the animals. 4. The competent authority shall immediately arrange to have the necessary measures carried out if the person responsible for the animals cannot be contacted or fails to comply with instructions. 5. Decisions taken by the competent authorities and the reasons for such decisions shall be notified as soon as possible to the transporter or his representative and to the competent authority which granted the authorisation as provided for in Article 10(1) or Article 11(1). If necessary the competent authorities shall provide assistance to the transporter to facilitate implementation of the required emergency measures. 1. The rules and information procedures set out in Council Directive 89/608/EEC (20) shall apply for the purposes of this Regulation. 2. Each Member State shall communicate details of a contact point for the purposes of this Regulation to the Commission, including, where available, an electronic address, within three months of the date of entry into force of this Regulation as well as any update of such data. The Commission shall forward details of the contact point to the other Member States within the framework of the Standing Committee on the Food Chain and Animal Health. The Member States shall lay down the rules on penalties applicable to infringements of the provisions of this Regulation and shall take all measures necessary to ensure that they are implemented. The penalties provided for must be effective, proportionate and dissuasive. The Member States shall notify those provisions, as well as provisions for the application of Article 26, to the Commission by 5 July 2006 at the latest and shall notify it without delay of any subsequent amendment affecting them. 1. In the case of any infringements of this Regulation, the competent authority shall take the specific measures provided for in paragraphs 2 to 7. 2. 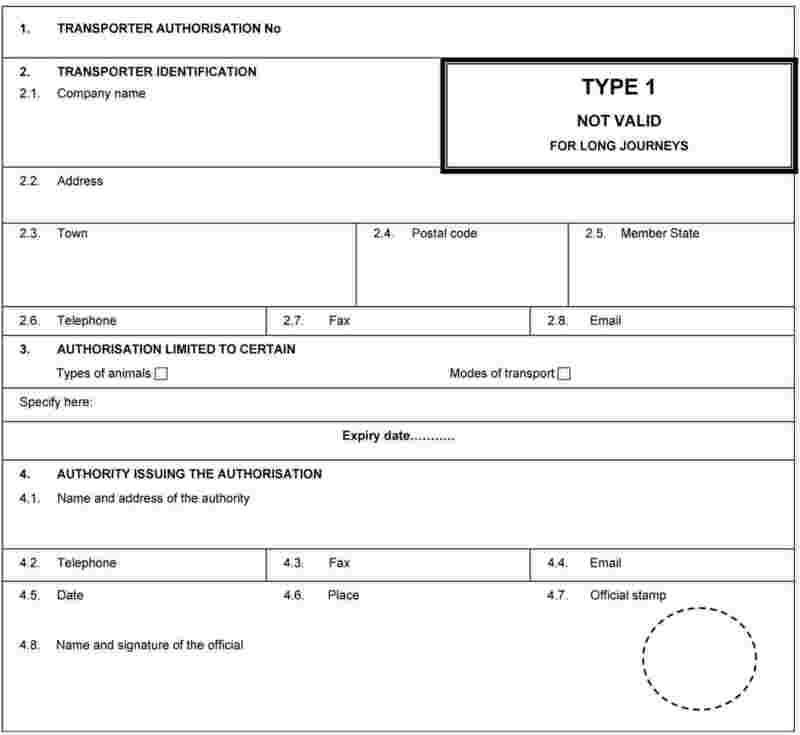 Where a competent authority establishes that a transporter has not observed, or a means of transport does not comply with this Regulation, it shall notify without delay the competent authority which granted the authorisation to the transporter or the certificate of approval of the means of transport and, where the driver is involved in the failure to observe the requirements of this Regulation, the one that issued the driver's certificate of competence. Any relevant data and documents shall accompany such notification. 3. Where a competent authority of a place of destination finds that the journey took place in breach of this Regulation, it shall notify without delay the competent authority of the place of departure. Any relevant data and documents shall accompany such notification. suspend or withdraw the authorisation of the transporter or the certificate of approval of the means of transport concerned. 5. In the case of infringement of this Regulation by a driver or attendant holding a certificate of competence as provided for in Article 17(2), the competent authority may suspend or withdraw the certificate of competence, in particular if the infringement shows that the driver or attendant lacks sufficient knowledge or awareness to transport animals in compliance with this Regulation. 6. In the case of repeated or serious infringements of this Regulation, a Member State may temporarily prohibit the transporter or means of transport concerned from transporting animals on its territory, even if the transporter or the means of transport is authorised by another Member State, provided that all the possibilities afforded by mutual assistance and exchange of information as provided for in Article 24 have been exhausted. 7. Member States shall ensure that all the contact points as provided for in Article 24(2) are notified without delay of any decision taken under paragraph 4(c), or paragraphs 5 or 6 of this Article. 1. The competent authority shall check that the requirements of this Regulation have been complied with, by carrying out non-discriminatory inspections of animals, means of transport and accompanying documents. Such inspections must be carried out on an adequate proportion of the animals transported each year within each Member State, and may be carried out at the same time as checks for other purposes. The proportion of inspections shall be increased where it is established that the provisions of this Regulation have been disregarded. The above proportions shall be determined in accordance with the procedures referred to in Article 31(2). 2. Member States shall submit to the Commission by 30 June each year an annual report for the previous year on the inspections provided for in paragraph 1. The report shall be accompanied by an analysis of the major deficiencies detected and an action plan to address them. Veterinary experts from the Commission may, in collaboration with the authorities of the Member State concerned and insofar as is necessary to ensure uniform application of this Regulation, make on-the-spot checks in accordance with the procedures laid down in Article 45 of Regulation (EC) No 882/2004 (21) of the European Parliament and of the Council. Member States shall encourage the development of guides to good practice which shall include guidance on compliance with this Regulation and in particular with Article 10(1). Such guides shall be drawn up at national level, among a number of Member States, or at Community level. Dissemination and use of national and Community guides shall be encouraged. 1. The Annexes to the Regulation shall be amended by the Council, acting by a qualified majority, on a proposal from the Commission, with a view in particular to their adaptation to technological and scientific progress, except as regards Chapter IV and Chapter VI, paragraph 3.1, of Annex I, Sections 1 to 5 of Annex II, Annex III, IV, V and VI which may be amended in accordance with the procedure referred to in Article 31(2). 2. Any detailed rules necessary for the implementation of this Regulation may be adopted in accordance with the procedure referred to in Article 31(2). 3. Certificates or other documents provided for by the Community veterinary legislation for live animals may be supplemented in accordance with the procedure referred to in Article 31(2) in order to take into account of the requirements of this Regulation. 4. The obligation to hold a certificate of competence as provided for in Article 6(5) may be extended to drivers or attendants of other domestic species in accordance with the procedure referred to in Article 31(2). 5. Derogations from paragraph 2(e) of Chapter I of Annex I may be adopted by the Commission in case of exceptional market support measures due to movement restrictions under veterinary disease control measures. The Committee referred to in Article 31 shall be informed of any measures adopted. 6. Derogations concerning requirements for long journeys to take account of the remoteness of certain regions from the mainland of the Community, may be adopted in accordance with the procedure as referred to in Article 31(2). 7. By way of derogation to this Regulation, Member States may continue to apply the current national provisions concerning transport of animals within their outermost regions, originating from or arriving at those regions. They shall inform the Commission thereof. 8. Pending the adoption of detailed provisions for species not explicitly mentioned in the Annexes, Member States may establish or maintain additional national rules applying to transport of animals of such species. 1. The Commission shall be assisted by the Standing Committee on the Food Chain and Animal Health, set up by Regulation (EC) No 178/2002 of the European Parliament and of the Council (22). 2. Where reference is made to this paragraph, Articles 5 and 7 of Decision 1999/468/EC shall apply. Within four years from the date mentioned in Article 37, second subparagraph, the Commission shall present a report to the European Parliament and to the Council on the impact of this Regulation on the welfare of animals being transported and on the trade flows of live animals within the enlarged Community. In particular, the report shall take into account scientific evidence on welfare needs of animals, and the report on the implementation of the navigation system, as referred to in Annex I, Chapter VI, paragraph 4.3, as well as the socio-economic implications of this Regulation, including regional aspects. This report may be accompanied if necessary by appropriate legislative proposals concerning long journeys, in particular as regards journey times, resting periods and space allowances. Directive 91/628/EEC and Regulation (EC) No 411/98 shall be repealed from 5 January 2007. References to the repealed Directive and Regulation shall be construed as references to this Regulation. (23) OJ L 3, 5.1.2005." (24) OJ L 224, 18.8.1990, p. 29." provide documentary evidence that these operations are performed by a third party approved by the competent authority. expected duration of each journey. 3. Transporters shall ensure that the consignment or animals do not at any time, between leaving the holdings or the assembly centre of origin and arriving at their destination, come into contact with animals of a lower health status. 4. Member States shall ensure that transporters observe the provisions of this Article relating to the appropriate documentation that must accompany the animals. 5. This Article shall not apply to persons transporting animals up to a maximum distance of 65 km counted from the place of departure to the place of destination. 6. In the event of failure to comply with this Article, the provisions concerning infringements and notifications of infringements provided for in Article 26 of Regulation (EC) No 1/2005 shall apply mutatis mutandis in relation to animal health.’. Animals must be moved with care. Passageways must be so constructed as to minimise the risk of injury to animals, and so arranged as to exploit their gregarious tendencies. Instruments intended for guiding animals must be used solely for that purpose, and only for short periods. The use of instruments which administer electric shocks shall be avoided as far as possible. In any case, these instruments shall only be used for adult bovine animals and adult pigs which refuse to move, and only when they have room ahead of them in which to move. Shocks shall last no longer than one second, be adequately spaced, and shall only be applied to the muscles of the hindquarters. Shocks shall not be used repeatedly if the animal fails to respond.’. (25) OJ L 3, 5.1.2005." 1. The competent authority shall approve and issue an approval number to each control post. Such approval may be limited to a particular species or to certain categories of animal and health status. Member States shall notify the Commission of the list of approved control posts and any updates. Member States shall also notify the Commission of the detailed arrangements in application of the provisions in Article 4(2), in particular the period of use as control posts and the double purpose of approved premises. 2. Control posts shall be listed by the Commission in accordance with the procedure referred to in Article 31(2) of Regulation (EC) No 1/2005 upon a proposal of the competent authority of the Member State concerned. undergo regular inspection, at least twice a year, to ascertain that the requirements for approval continue to be fulfilled. 4. A Member State must, in serious cases, particularly on animal health or welfare grounds, suspend the use of a control post situated in its territory. It shall inform the Commission and the other Member States of such suspension and of its reasons. The suspension of the use of the control post may only be lifted after notification to the Commission and the other Member States on its reasons. 1. Before the animals leave the control post, the official veterinarian or any veterinarian designated for this purpose by the competent authority shall confirm on the journey log as referred to in Annex II of Regulation (EC) No 1/2005 that the animals are fit to continue their journey. Member States may stipulate that expenditure incurred as a result of the veterinary check shall be borne by the operator concerned. be cleansed and disinfected before and after each use, as required by the official veterinarian. Personnel and equipment entering into contact with the animals accommodated shall be exclusively dedicated to the premises concerned unless they have been subject to a cleaning and disinfection procedure after being in contact with the animals or their faeces or urine. In particular the person in charge of the control post shall provide clean equipment and protective clothes, which shall be kept exclusively for the use of any persons entering the control post, and shall make available suitable equipment for cleansing and disinfecting the above items. Bedding material shall be removed when a consignment of animals is moved from an enclosure and, after the cleansing and disinfecting operations provided for in point 1(c), shall be replaced by fresh bedding. Animals litter, faeces and urine shall not be collected from the premises unless they have been subject to an appropriate treatment in order to avoid the spreading of animal diseases. Appropriate sanitary breaks between two consecutive consignments of animals shall be respected and if appropriate adapted depending on whether they come from a similar region, zone or compartment. In particular, control posts shall be completely cleared of animals for a period of at least 24 hours after a maximum of 6 days' use and after cleansing and disinfecting operations have been carried out, and prior to the arrival of any new consignment. Annex II shall be deleted. It shall apply as from 5 January 2007. However, Article 6(5) shall apply as from 5 January 2008. Done at Brussels, 22 December 2004. (1) Opinion delivered on 30 March 2004 (not yet published in the Official Journal). (2) OJ C 110, 30.4.2004, p. 135. (3) OJ L 340, 11.12.1991, p. 17. Directive as last amended by Regulation (EC) No 806/2003 (OJ L 122, 16.5.2003, p. 1). (4) OJ L 148, 30.6.1995, p. 52. (5) OJ C 273, 28.9.2001, p. 1. (6) OJ L 174, 2.7.1997, p. 1. Regulation as last amended by Regulation (EC) No 1040/2003 (OJ L 151, 19.6.2003, p. 21). (7) OJ L 370, 31.12.1985, p. 1. (8) OJ L 370, 31.12.1985, p. 8. Regulation as last amended by Commission Regulation (EC) No 432/2004 (OJ L 71, 10.3.2004, p. 3). (9) OJ L 224, 18.8.1990, p. 42. Directive as last amended by Directive 2004/68/EC (OJ L 139, 30.4.2004, p. 320). (10) OJ P 121, 29.7.1964, p. 1977/64. Directive as last amended by Regulation (EC) No 21/2004 (OJ L 5, 9.1.2004, p. 8). (11) OJ L 340, 31.12.1993, p. 21. Directive as amended by Regulation (EC) No 806/2003 (OJ L 122, 16.5.2003, p. 1). (12) OJ L 351, 2.12.1989, p. 34. (13) OJ L 38, 12.2.1998, p. 10. (14) OJ L 52, 21.2.1998, p. 8. (16) OJ L 268, 24.9.1991, p. 56. Directive as last amended by the 2003 Act of Accession. (17) OJ L 224, 18.8.1990, p. 29. Directive as last amended by Directive 2002/33/EC of the European Parliament and of the Council (OJ L 315, 19.11.2002, p. 14). (18) OJ L 224, 18.8.1990, p. 42. Directive as last amended by Directive 2004/68/EC (OJ L 139, 30.4.2004, p. 320). (19) OJ L 226, 25.6.2004, p. 83. (20) OJ L 351, 2.12.1989, p. 34. (21) OJ L 191, 28.5.2004, p. 1. (22) OJ L 31, 1.2.2002, p. 1. Regulation as last amended by Regulation (EC) No 1642/2003 (OJ L 245, 29.9.2003, p. 4). No animal shall be transported unless it is fit for the intended journey, and all animals shall be transported in conditions guaranteed not to cause them injury or unnecessary suffering. they are cervine animals in velvet. animals that have been submitted to veterinary procedures in relation to farming practices such as dehorning or castration, provided that wounds have completely healed. When animals fall ill or are injured during transport, they shall be separated from the others and receive first-aid treatment as soon as possible. They shall be given appropriate veterinary treatment and if necessary undergo emergency slaughter or killing in a way which does not cause them any unnecessary suffering. Sedatives shall not be used on animals to be transported unless strictly necessary to ensure the welfare of the animals and shall only be used under veterinary supervision. Lactating females of bovine, ovine and caprine species not accompanied by their offspring shall be milked at intervals of not more than 12 hours. Requirements of paragraphs 2(c) and 2(d) do not apply for registered Equidae if the purpose of the journeys is to improve the health and welfare conditions of birth, or for newly born foals with their registered mares, provided that in both cases the animals are permanently accompanied by an attendant, dedicated to them during the journey. provide a means of lighting sufficient for inspection and care of the animals during transport. Sufficient space shall be provided inside the animals' compartment and at each of its levels to ensure that there is adequate ventilation above the animals when they are in a naturally standing position, without on any account hindering their natural movement. written instructions about feeding, watering and any special care required. Partitions shall be strong enough to withstand the weight of animals. Fittings shall be designed for quick and easy operation. Piglets of less than 10 kgs, lambs of less than 20 kgs, calves of less than six months and foals of less than four months of age shall be provided with appropriate bedding material or equivalent material which guarantees their comfort appropriate to the species, the number of animals being transported, the journey time, and the weather. This material has to ensure adequate absorption of urine and faeces. Without prejudice to Community or national rules on crew and passenger safety, where transport on a vessel, an aircraft or a rail wagon is to last more than three hours, a means of killing suitable for the species shall be available to the attendant or a person on board who has the necessary skill to perform this task humanely and efficiently. Vehicles in which animals are transported shall be clearly and visibly marked indicating the presence of live animals, except when the animals are transported in containers marked in accordance with paragraph 5.1. Road vehicles shall carry suitable equipment for loading and unloading. When assembling trains and during all other movement of rail wagons every precaution shall be taken to avoid jolting of a rail wagon containing animals. on open decks, adequate protection from sea water is provided. Road vehicles and rail wagons shall be equipped with a sufficient number of adequately designed, positioned and maintained securing points enabling them to be securely fastened to the vessel. Road vehicles and rail wagons shall be secured to the vessel before the start of the sea journey to prevent them being displaced by the motion of the vessel. Animals shall be transported in containers, pens or stalls appropriate for the species, which comply with International Air Transport Association (IATA) live animals Regulations, in its version referred to in Annex VI. Animals shall be transported only in conditions where air quality, temperature and pressure can be maintained within an appropriate range during the entire journey, having regard to the species of animals. Containers in which animals are transported shall be clearly and visibly marked, indicating the presence of live animals and with a sign indicating the top of the container. During transport and handling, containers shall always be kept upright and severe jolts or shaking shall be minimised. Containers shall be secured so as to prevent displacement due to the movement of the means of transport. Containers of more that 50 kg shall be equipped with a sufficient number of adequately designed, positioned and maintained securing points enabling them to be securely fastened to the means of transport where they are to be loaded. Containers shall be secured to the means of transport before the start of the journey to prevent displacement due to the motion of the means of transport. Due regard shall be paid to the need of certain categories of animals, such as wild animals, to become acclimatised to the mode of transport prior to the proposed journey. operations shall be supervised by an authorised veterinarian and particular precautions shall be taken to ensure that the welfare of the animals is properly maintained during these operations. lifting platforms and upper floors shall have safety barriers so as to prevent animals falling or escaping during loading and unloading operations. Goods which are being transported in the same means of transport as animals shall be positioned so that they do not cause injury, suffering or distress to the animals. Appropriate lighting shall be provided during loading and unloading. to ensure that ventilation is not impeded. knowingly obstruct any animal which is being driven or led through any part where animals are handled. The use of instruments which administer electric shocks shall be avoided as far as possible. In any case, these instruments shall only be used for adult bovine animals and adult pigs which refuse to move and only when they have room ahead of them in which to move. The shocks shall last no longer than one second, be adequately spaced and shall only be applied to the muscles of the hindquarters. Shocks shall not be used repeatedly if the animal fails to respond. Markets or assembly centres shall provide equipment for tethering animals when necessary. Animals not used to being tied shall remain untied. Animals shall have access to water. Animals shall not be tied by the horns, the antlers, the nose rings nor by legs tied together. Calves shall not be muzzled. Domestic Equidae older than eight months shall wear halters during transport except for unbroken horses. designed in such a way as to eliminate any danger of strangulation or injury, and so as to allow animals to be quickly released. tied animals from untied animals. Points (a), (b), (c) and (e) of paragraph 1.12. shall not apply where the animals have been raised in compatible groups, are accustomed to each other, where separation will cause distress or where females are accompanied by dependent young. Space allowances shall at least comply with the figures laid down, in respect of the animals and the means of transport referred to, in Chapter VII. Domestic Equidae except mares travelling with their foals shall be transported in individual stalls when the vehicle is loaded onto a Roll-on-Roll-off vessel. Derogation to this provision may be granted under national rules provided that they are notified by the Member States to the Standing Committee on the food Chain and Animal Health. Equidae shall not be transported in multi-deck vehicles except if animals are loaded on the lowest deck with no animals on higher deck. The minimum internal height of compartment shall be at least 75 cm higher than the height of the withers of the highest animal. Unbroken Equidae shall not be transported in groups of more than four individuals. Paragraphs 1.10. to 1.13. shall apply mutatis mutandis to the means of transport. Sufficient ventilation shall be provided to ensure that the needs of the animals are fully met taking into account in particular the number and type of the animals to be transported and the expected weather conditions during the journey. Containers shall be stored in a way which does not impede their ventilation. During transport, animals shall be offered water, feed and the opportunity to rest as appropriate to their species and age, at suitable intervals and in particular as referred to in Chapter V. If not otherwise specified, Mammals and Birds shall be fed at least every 24 hours and watered at least every 12 hours. The water and feed shall be of good quality and presented to the animals in a way which minimises contamination. Due regard shall be paid to the need of animals to become accustomed to the mode of feeding and watering. Strength for pen rails and decks shall be appropriate to the transported animals. Strength calculations of pen rails and decks shall be verified during construction or conversion of the livestock vessel by a classification society approved by the competent authority. 75 % of the above relevant capacity if the compartment is partially enclosed. Storage or production capacity for fresh water shall be appropriate to meet the water requirement laid down in Chapter VI taking into account the maximum number and the type of animals to be transported as well as the maximum duration of the intended journeys. The fresh water system shall be capable of supplying freshwater continuously in each livestock area and sufficient receptacles shall be available to ensure that all animals have easy and constant access to fresh water. Alternative pumping equipment shall be available to ensure water supply in the event of failure of the primary pumping system. The drainage system shall be of appropriate capacity to drain fluids from pens and decks under all conditions. Drainpipes and channels shall collect the fluids in wells or tanks from where sewage can be discharged by means of pumps or ejectors. Alternative pumping equipment shall be available to ensure drainage in the event of failure of the primary pumping system. Livestock areas, passageways and ramps to livestock areas shall be provided with sufficient lighting. Emergency lighting shall be available in case of a failure of the main electrical installation. Sufficient portable lighting shall be provided to allow the attendant adequate inspection and care of the animals. A fire fighting system shall be appropriately installed in all livestock areas and fire equipment within the livestock areas shall comply with the most recent the International Convention for the Safety of Life at Sea (SOLAS) standards regarding fire protection, fire detection and fire extinction. fresh water production if necessary. A primary source of power shall be sufficient to supply continuous power for the systems for livestock referred to in paragraphs (2) (4) (5) and (6) under normal operation of the livestock vessel. A secondary source of power shall be sufficient to replace the primary source of power for a continuous period of three days. Livestock vessels or vessels transporting sea containers with domestic Equidae and domestic animals of bovine, ovine, caprine and porcine species, for journeys exceeding 24 hours, shall carry from the time of departure sufficient bedding as well as sufficient feed and water to cover the minimum daily feed and water supply requirements set out in Table 1 for the intended journey plus 25 % or three days' spare supply of bedding, feed and water, whichever is the greater. Fodder may be replaced by concentrated feed and vice versa. However, due regard shall be paid to the need of certain categories of animals, to become accustomed to the change of feed with regard to their metabolic needs. The requirements laid down in this Section apply to the movement of domestic Equidae, except registered Equidae, domestic animals of bovine, ovine, caprine and porcine species, except in the case of air transport. Journey times for animals belonging to the species referred to in point 1.1. shall not exceed eight hours. The maximum journey time in point 1.2. may be extended if the additional requirements of Chapter VI are met. All other animals of the species referred to in point 1.1. must, after 14 hours of travel, be given a rest period of at least one hour sufficient for them in particular to be given liquid and if necessary fed. After this rest period, they may be transported for a further 14 hours. After the journey time laid down, animals must be unloaded, fed and watered and be rested for at least 24 hours. Animals must not be transported by train if the maximum journey time exceeds that laid down in point 1.2. However, the journey times laid down in point 1.4. shall apply where the conditions laid down in points 1.3. and 1.4, except for rest periods, are met. Animals must not be transported by sea if the maximum journey time exceeds that laid down in point 1.2, unless the conditions laid down in points 1.3. and 1.4, apart from journey times and rest periods, are met. In the case of transport by sea on a regular and direct link between two geographical points of the Community by means of vehicles loaded on to vessels without unloading of the animals, the latter must be rested for 12 hours after unloading at the port of destination or in its immediate vicinity unless the journey time at sea is such that the voyage can be included in the general scheme of points 1.2. to 1.4. In the interests of the animals, the journey times in points 1.3, 1.4. and 1.7(b) may be extended by two hours, taking account in particular of proximity to the place of destination. Without prejudice to the provisions of points 1.3. to 1.8, Member States are authorised to provide for a maximum non-extendible journey time of eight hours for the transport of animals destined for slaughter, where the transport is carried out exclusively from a place of departure to a place of destination both situated on their own territory. 24 hours for chicks of all species, provided that it is completed within 72 hours after hatching. Dogs and cats being transported shall be fed at intervals of not more than 24 hours and given water at intervals of not more than eight hours. There shall be clear written instructions about feeding and watering. Other species other than those referred to in point 2.1. or 2.2. shall be transported in accordance with the written instructions about feeding and watering and taking into account any special care required. The means of transport shall be equipped with a roof of light-colour and be properly insulated. Animals shall be provided with appropriate bedding or equivalent material which guarantees their comfort appropriate to the species, the number of animals being transported, the journey time, and the weather. This material has to ensure adequate absorption of urine and faeces. The means of transport shall carry a sufficient quantity of appropriate feedingstuff for the feeding requirements of the animals in question during the journey concerned. The feedingstuffs shall be protected from the weather and from contaminants such as dust, fuel, exhaust gases and animal urine and dung. Where specific feeding equipment is used for the feeding of animals, that equipment shall be transported in the means of transport. Where feeding equipment as referred to in paragraph 1.4. is used, it shall be so designed that, if necessary, it is attached to the means of transport to prevent its being overturned. When the means of transport is moving and when the equipment is not in use, it shall be stored separate from the animals. Equidae shall be transported in individual stalls except mares travelling with their foals. The means of transport must be fitted with partitions so that separate compartments may be created, while providing all the animals with free access to water. The partitions shall be constructed in such a way that they can be placed in different positions so that the size of compartment can be adapted to specific requirements, and to the type, size and number of animals. pigs are heavier than 10 kgs. Unbroken horses shall not be transported on long journeys. The means of transport and sea containers shall be equipped with a water supply that makes it possible for the attendant to provide water instantly whenever it is necessary during the journey, so that each animal has access to water. The watering devices shall be in good working order and be appropriately designed and positioned for the categories of animals to be watered on board the vehicle. The water tanks' total capacity for each means of transport shall be at least equal to 1,5 % of its maximum payload. Water tanks must be designed so that they can be drained and cleaned after each journey and must be fitted with a system allowing their water level to be checked. They must be connected to drinking devices within the compartments and maintained in good working order. A derogation from point 2.3. may apply to sea containers exclusively used on vessels that supply water to them from the vessel's own water tanks. Ventilation systems on means of transport by road shall be designed, constructed and maintained in such way that, at any time during the journey, whether the means of transport is stationary or moving, they are capable of maintaining a range of temperatures from 5 oC to 30 oC within the means of transport, for all animals, with a +/- 5 oC tolerance, depending on the outside temperature. The ventilation system must be capable of ensuring even distribution throughout with a minimum airflow of nominal capacity of 60 m3/h/KN of payload. It must be capable of operating for at least 4 hours, independently of the vehicle engine. Means of transport by road must be fitted with a temperature monitoring system as well as with a means of recording such data. Sensors must be located in the parts of the lorry which, depending on its design characteristics, are most likely to experience the worst climatic conditions. Temperature recordings obtained in such manner shall be dated and made available to the competent authority upon request. Means of transport by road must be fitted with a warning system in order to alert the driver when the temperature in the compartments where animals are located reaches the maximum or the minimum limit. The Commission shall elaborate before 31 July 2005 a report on the basis of an opinion of the European Food Safety Authority, accompanied by appropriate draft measures with a view to establishing a range of maximum and minimum temperatures for the transported animals, to be adopted in accordance with the procedure referred to in Article 31(2), taking into account the prevailing temperatures within certain regions of the Community having particular climatic conditions. Means of transport by road must be equipped as from 1 January 2007 for means of transport by road for the first time in service and as from 1 January 2009 onwards for all means of transport, with the appropriate Navigation System allowing for recording and providing information equivalent to those mentioned in the journey log as referred to in Annex II, Section 4, and information concerning opening/closing of the loading flap. The Commission shall submit to the Council, by 1 January 2008, the results of study of navigation systems and the application of such technology for the purpose of this Regulation. The Commission shall submit to the Council, not later than 1 January 2010, a report on the implementation of the Navigation System referred to in paragraph 4.2, accompanied by any proposals it would deem appropriate, aimed in particular at defining specifications of the Navigation System to be used for all means of transport. The Council shall act on such proposals by qualified majority. These figures may vary by a maximum of 10 % for adult horses and ponies and by a maximum of 20 % for young horses and foals, depending not only on the horses' weight and size but also on their physical condition, the meteorological conditions and the likely journey time. These figures may vary, depending not only on the animals' weight and size but also on their physical condition, the meteorological conditions and the likely journey time. Pregnant animals must be allowed 10 % more space. The surface area indicated above may vary depending on the breed, the size, the physical condition and the length of fleece of the animals, as well as on the meteorological conditions and the journey time. The surface area indicated above may vary depending on the breed, the size, the physical condition and the length of fleece of the animals, as well as on the meteorological conditions and the journey time. As an indication: for small lambs, an area of under 0,2 m2 per animal may be provided. All pigs must at least be able to lie down and stand up in their natural position. In order to comply with these minimum requirements, the loading density for pigs of around 100 kg should not exceed 235 kg/m2. The breed, size and physical condition of the pigs may mean that the minimum required surface area given above has to be increased; a maximum increase of 20 % may also be required depending on the meteorological conditions and the journey time. The loading density should be relatively high to preclude injury on takeoff or landing or in the event of turbulence, although all animals must still be able to lie down. The climate, total journey time and hour of arrival should be taken into account in deciding on the loading density. These figures may vary depending not only on the weight and size of the birds but also on their physical condition, the meteorological conditions and the likely journey time. (1) OJ L 358, 18.12.1986 p. 1. Directive as last amended by Directive 2003/65/EC of the European Parliament and of the Council (OJ L 230, 16.9.2003, p. 32). (2) The minimum water supply requirements laid down in the fourth column may be replaced for all species by a water supply of 10 % of the live weight of the animals. (3) The standard useable width of wagons is 2 to 2 m.
A person planning a long journey shall prepare, stamp and sign all pages of the journey log in accordance with the provisions of this Annex. Section 5 — Specimen anomaly report. The pages of the journey log shall be fastened together. Models of each section are set out in the Appendix hereto. ensure that the journey log accompanies the animals during the journey until the point of destination or, in case of export to a third country, at least until the exit point. Keepers at the place of departure and, when the place of destination is located within the territory of the Community, keepers at the place of destination, shall complete and sign the relevant sections of the journey log. They shall inform the competent authority of any reservations concerning compliance with the provisions of this Regulation using the specimen form in Section 5 as soon as possible. When the place of destination is located within the territory of the Community, keepers at the place of destination shall keep the journey log, except Section 4, for at least three years from the date of arrival at the place of destination. The journey log shall be made available to the competent authority upon request. When the journey has been completed within the territory of the Community, the transporter shall complete and sign Section 4 of the journey log. If animals are exported to a third country, transporters shall give the journey log to the official veterinarian at the exit point. In the case of export of live bovine animals with refunds, Section 3 of the journey log shall not be required if the agricultural legislation requires a report. 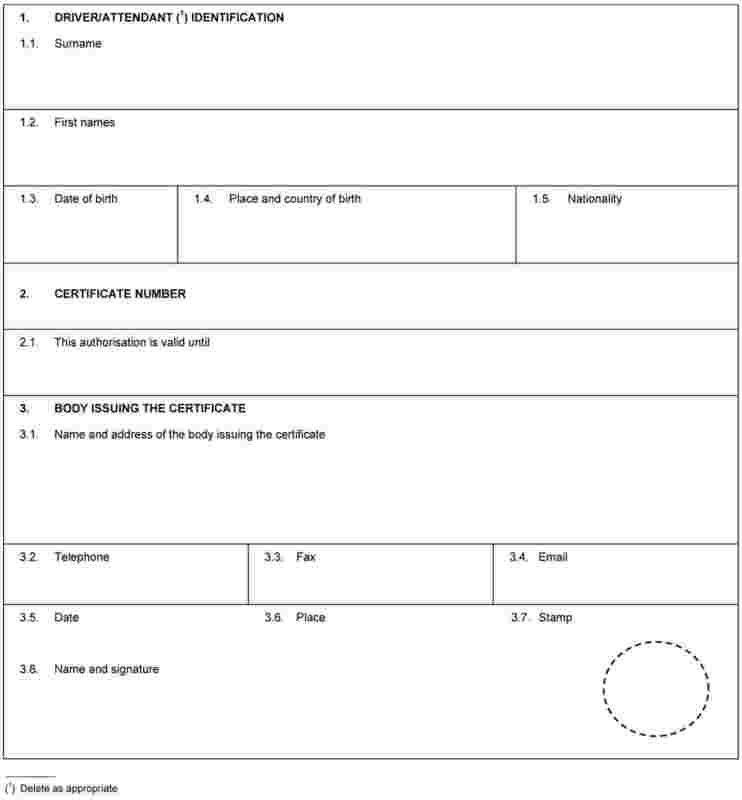 the corresponding record sheet or print out as referred to in Annex I or Annex IB to Regulation (EEC) No 3821/85 if the vehicle is covered by that Regulation. 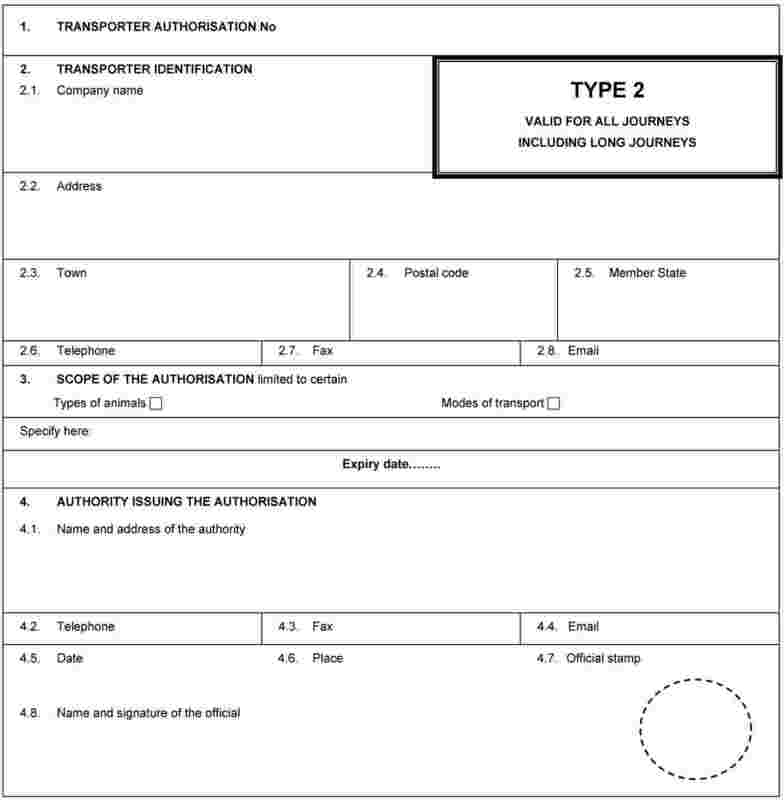 Documents referred to in points (a) and (b) shall be made available to the competent authority which granted the transporter's authorisation and upon request to the competent authority of the place of departure, within one month after it has been completed and shall be kept by the transporter for a period of at least three years from the date of the check. 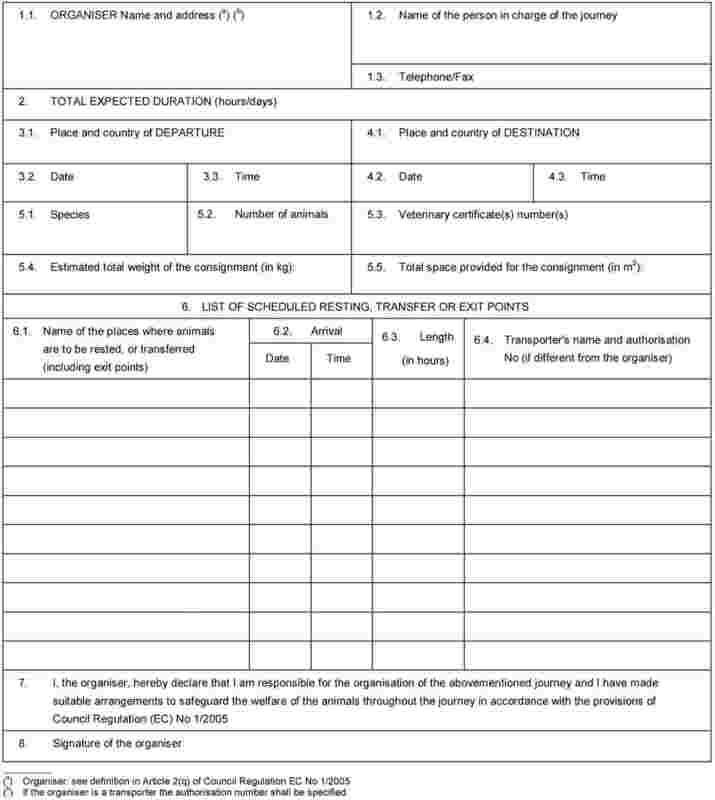 Documents referred to in point (a) shall be returned to the competent authority of the place of departure within 1 month after the completion of the journey, unless the systems referred to in Article 6(9) were used. A simplified version of the journey log and guidelines for the presentation of the records referred to in Article 6(9) shall be established in accordance with the procedure referred to in Article 31(2), when vehicles are equipped with the systems referred to in Article 6(9). A copy of the anomaly report accompanied by a copy of Section 1 of the journey log shall be transmitted to the competent authority. Road drivers and attendants as referred to in Article 6(5) and Article 17(1) shall have successfully completed the training as provided for in paragraph 2 and have passed an examination approved by the competent authority, which shall ensure that examiners are independent. safety considerations for personnel handling animals. The European Convention for the protection of animals during international transport. International Air Transport Association (IATA) live animals regulations 31st Edition, 1 October 2004.